I’m a big fan of clean boosts. They’re for big parts, solos, etc.. but it depends on what you’re going for. Some players like a little color in their signal, while others want to maintain their original tone, but boosted. The Pigtronix Class A Boost.. is Class A. Some of you guys might not be familiar with this. This generally goes with amps. Some of my favorite amps are Class A.. for example, I play a Matchless and it’s all Class A goodness. As compared with the other amplifier classes we’ll cover, Class A amps are relatively simple devices. The defining principle of Class A operation is that all of an amplifier’s output devices must be conducting through the full 360 degree cycle of a waveform. Class A can also be broken down into single ended and push/pull amplifiers. Push/pull diverges from the basic explanation above by utilizing output devices in pairs.While both devices are conducting through the full 360 degree cycle, one device will shoulder more of the load during the positive portion of the cycle, while the other handles more of the negative cycle; the primary advantage of this arrangement is reduced distortion relative to single ended designs, as even order harmonics are cancelled out. In addition, push/pull Class A designs are less susceptible to hum; single ended designs tend to require special attention to the power supply to mitigate this issue. Because of the positive attributes associated with Class A operation, it is considered the gold standard for audio quality in many audiophile circles. However, there is one important drawback to these designs: efficiency. The requirement of Class A designs to have all output devices conducting at all times results in significant amounts of wasted power, which is ultimately converted to heat. This is further exacerbated by the fact that Class A designs require relatively high levels of quiescent current, which is the amount of current flowing through the output devices when the amplifier is producing zero output. Real world efficiency rates can be on the order of 15-35%, with the potential to drop into the single digits using highly dynamic source material. So, let’s talk about Pigtronix Class A Boost. The Class A boost can deliver up to 20dB of clean boost. It has great signal to noise performance and is great to pound the preamp of the amp, or to drive/boost pedals in your chain. Controls are simple. Knob for rock level and on/off footswitch. I also wanted to talk about this, because today it’s Musician’s Friend Stupid Deal of the Day. 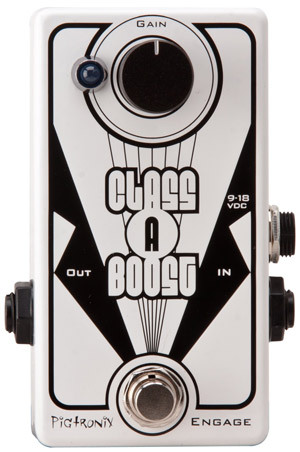 Typically, the Pigtronix Class A Boost is available for $130, but is currently on sale for an insanely low price of $49!!!! That’s 62% off the going rate! Also, this is available with FREE shipping. Seriously people, you better jump on this. For those of you not familiar with Musician’s Friend Stupid Deal of the Day, the deal will only run for a single day OR if it’s sold out. At that point, the item will shift to another item. So, if you’re digging this pedal, I would jump on it quickly because it won’t last!